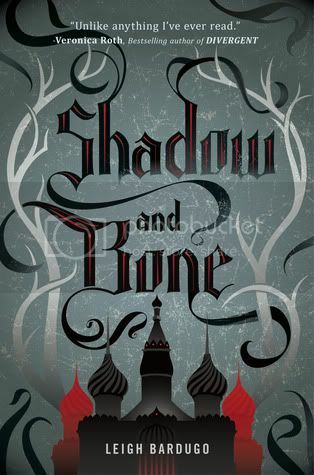 The thing I loved most about Shadow and Bone was how completely unique the book was. I can honestly say that I have read nothing like this before, and I enjoyed every minute of it! The characters were amazing, the storyline was creative, and I was completely hooked to this book. The main character in the story is Alina. Alina is a girl that was raised in an orphanage with her best friend, Mal. She’s a normal girl, never to get a second glance. Until the unspeakable happens and she discovers a long hidden Grisha talent, a talent that no other person has. We see Alina grow leaps and bounds in this book, and we watch as she becomes stronger and more confident in herself. This is the type of character that I really grow to love. Alina and Mal have been together almost all of their lives, from their time at the orphanage, to their time in the military. The more I read about these two characters, the more I believe they are absolutely perfect for each other. Mal is willing to do anything in the world to keep Alina safe. I loved him for that. The Darkling, who is basically the ultimate Greisha, was such a mysterious character. He would also do whatever he has to do to keep Alina safe, but not for the same reasons as Mal. The Darkling has plans for the world, plans that he cannot accomplish without Alina, and he will stop at nothing to have things his way. The world-building for this book was absolutely fascinating. It amazes me how authors come up with these super-creative worlds that I become completely engrossed with. The storyline was excellent as well. Just when I thought I had everything figured out, the author completely threw me a curveball. I totally didn’t see it coming at all! These are the things that make for excellent reads! Overall, I enjoyed this book so much more than I expected to. I must have a finished copy of this book to add to my bookshelf, and I can’t wait to get a hold of the next book in the series! I can't wait to read this. I have it saved for my trip in a week and a half. Can't wait till we get to the airport so I can start reading it. This is probably my second favorite book of the year so far! I loved sooo much. The Darkling! The twists and turns! It was all so amazing. I can't wait for the next book. I have heard so many amazing things about this book, I have to read it soon! It really does sound unique - I love that it's really different to anything else out there. And Alina sounds like a great MC! Thanks for the fab review :). Yes, yes, yes and more YES!! I loved being plunged into that amazingly dark and awesome world--and everything else you said. Makes me want to read it again. This looks like a good read, I love watching characters transform! Wonderful review, Christy! I'm so happy to hear that you enjoyed it. I've heard many wonderful things about it, including just how unique and beautifully imagined it is - I love the premise, the setting and all the Eastern European accents in this story - can't wait to read it! Thanks so much for your fabulous review! I really loved the character of the Darkling...until that part, which flipped the script for me. I am interested to hear more about the second book and what will happen there.